If you would like to visit a different Blog in the jog, go to Blog Jog Schedule. November 21, 2010 is the 38th annual World Hello Day. Anyone can participate in World Hello Day simply by greeting ten people. Blog jogging is a great way to do just that! Have fun exploring! 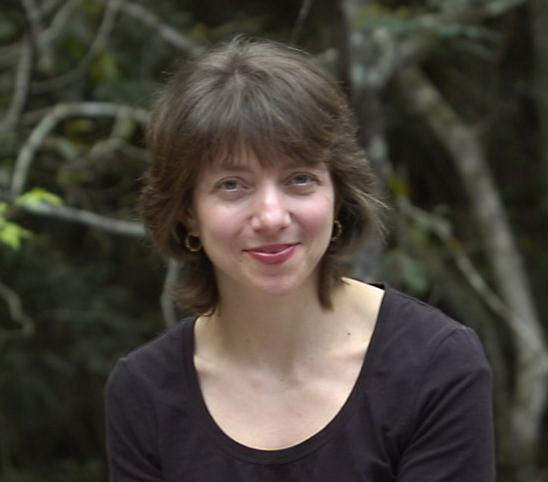 My guest today is Magdalena Ball who runs The Compulsive Reader. Her short stories, editorials, poetry, reviews and articles have appeared in a wide number of printed anthologies and journals. She is also the author of the poetry book Repulsion Thrust, the novel Sleep Before Evening, a nonfiction book The Art of Assessment: How to Review Anything and three other poetry chapbooks Quark Soup, and, in collaboration with Carolyn Howard-Johnson, Cherished Pulse and She Wore Emerald Then. But what does “special” mean? Do I really mean “every way” (maybe not every single way…). The problem with greetings is that they really can’t be done without effort. If you dash off something slapdash and fast, the meaning behind the action gets lost. In other words, passing on easy cliché may be less meaningful than no words at all. The whole point of taking the time to say something important to someone is to make a connection. It’s easy to miss those connections in this fast paced, multi-tasking world of ours. Let’s see – I’ll cook dinner, finish a business report, bathe the kids, and send off a greeting card to my mother in the next hour. If you don’t personalise or try to say something that really captures how you feel in a way that is powerful and moving, the whole point of taking the time to make that communication is lost. Here’s a sample poem, which can also be listened to (in the author’s own voice) at The Compulsive Reader. vibrating the universe of your illusory body. 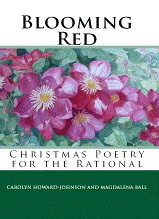 More on Magdalena Ball can be found at her website. 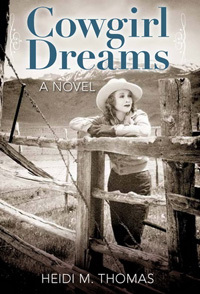 To learn more about another author, check out Kathy Stemke’s blog tomorrow. 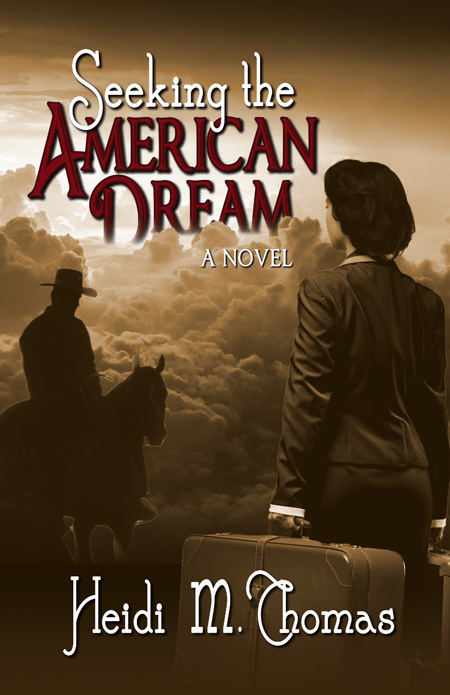 She’s featuring Stephen Tremp who has just had his first action suspense novel released: Breakthrough. 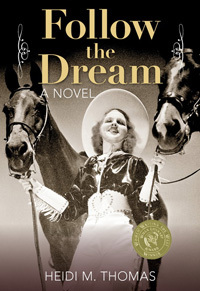 My guest today is Sharon Miner, author of three novels and four non-fiction books in the Beloved Horse series. 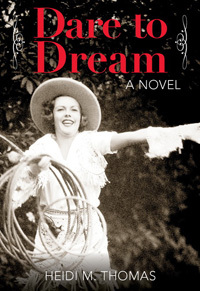 Her newest book is Beloved Horses in Second Careers. Sharon grew up in Connecticut, the middle child of eleven. An avid horse lover at an early age, she would beg her daddy to find horses during the family’s drives in the countryside on Sundays. She collected glass horses and kept a scrapbook of horse pictures. 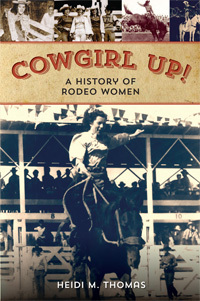 As a teenager, she learned to ride and care for horses at a local riding stable. 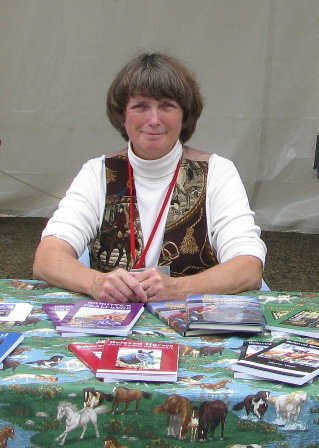 Currently, Sharon and her husband, Bob, live in Tampa, Florida and travel throughout the United States with their Irish Terrier, Woogie, interviewing riders at horse shows as well as marketing her books. I see you’ve been a life-long horse enthusiast. Tell us how you got starting writing about horses. When a very special horse of mine named Fawn died, I wanted to share her story. I knew I needed to learn the steps on how to write and have a book published, so I took a writing course through the Institute of Children’s Literature. After my first book was published in 1993, I worked for 12 years at a local newspaper to hone my writing skills. Did you always want to write or was it something you decided to do later in life? My first love was horses, and I made a goal when I was 11 yrs old to have my own stable in 10 years. I accomplished that goal, and my next goal (as an adult) was to be an author. 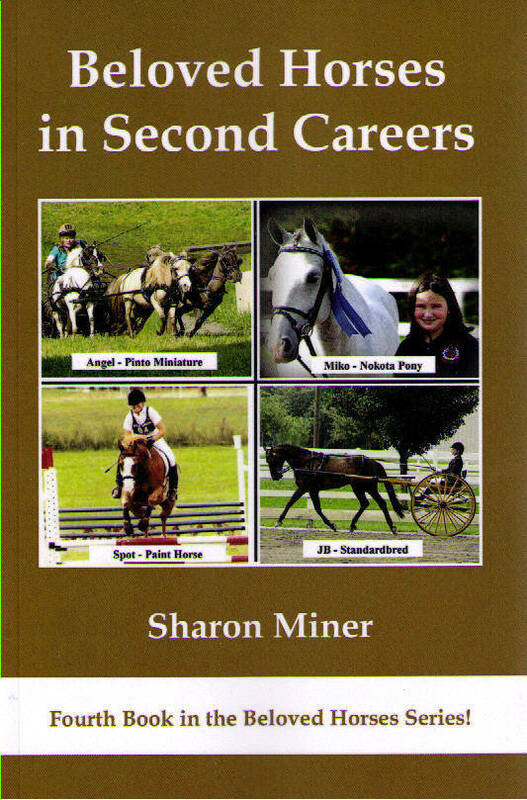 Your newest book is Beloved Horses in Second Careers, the fourth in a series. How did you come to write this series? When I closed my Unicorn Stables after 25 years to pursue traveling, I wanted to share the magic of horses with others. As I traveled promoting the book, people I met wanted to share their horse stories – so the series was born. You’ve also written three young adult novels. Do you have plans for more fiction? Yes, I’m working on a novel based on my grandfather’s childhood – a hot-tempered orphan boy who was sent on an “Orphan Train” to Colorado in the late 1800’s. This was the beginning of foster care. But no one was there to meet the boy, so the town drunk took him in. Oh, that sounds like a wonderful, exciting story! Which do you like writing the best—fiction or non-fiction? Both! You are also a speaker on various writing topics, including unique marketing tips. Can you share a couple of those with us? Marketing books at non-profit fundraisers/membership drives receive a great response since publicity is more likely to be printed. It’s a win-win for all! Do you still own horses and ride? My last horse from Unicorn Stables, named Sonny, is 30 yrs old and retired in NJ. I only ride maybe once a year, at a local stable in Tampa area. What piece of advice can you offer to aspiring writers? My advice for those wanting to write: Declare your goals (I still have that piece of paper with my 11 yr old goal), seek advice, learn the craft of writing at workshops, conferences and school/college classes, and most of all – never give up! Sharon, thank you for sharing your riding and writing journey with us! Sharon’s books are available through her website and at Amazon.com. Two weeks ago, our beloved 19-year-old cat, Ipsie, went to that great catnip garden in the sky. Those who don’t have pets probably don’t understand, but it’s as great a loss as a member of the family. It was time, though–in human years he was nearly 95, and he’d had a long, healthy life. Every time we thought “this is it,” he would somehow find another cat-life and bounce back. I think he used up more than the proverbial nine lives–more like 99 lives. 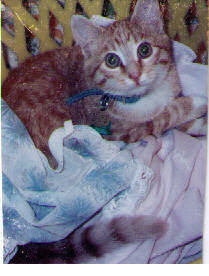 This handsome orange tabby found us in August of 1991. My husband is involved in shooting sports and one Sunday he was running a match near Missoula, MT. He said he was aware of some women carrying a kitten around, but thought it belonged to one of them. After the match was over, they came up to him and said that they’d found this kitten and since he was the match director, it was his responsibility to do something about it. 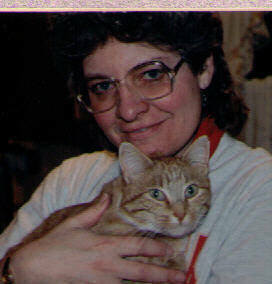 We’d just lost our 17-year-old cat, Thunderfoot, a few months earlier, so he called me at work and said, “We have a little problem.” He told me what had transpired, and I said, “What’s the problem, bring it home!” The ladies who had found him named him Ipsc, which is the acronym for the International Practical Shooting Confederation, the type of competition my husband participates in. We laughed, said it was the International Practical Shooting Cat, and I called him Ipsie–an easier name for me to explain. 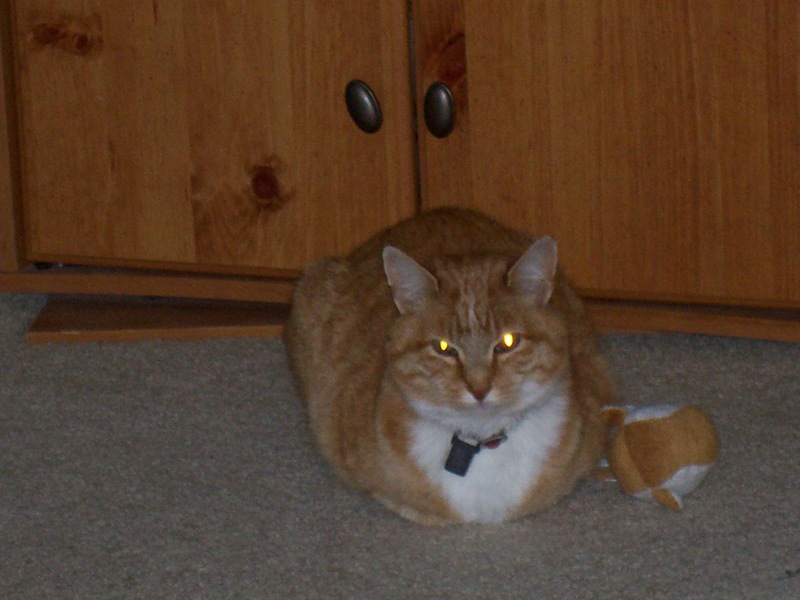 He was a playful, feisty cat, also known as “Slasher Cat.” While he enjoyed laptime and a good head scratch, when he was done with that he let us know by slashing out with his lightning-swift claws. As he got older, he mellowed and liked prolonged head scratching–as long as his human’s hand could hold out. Yes, we had some good years with our cat with 99 lives.